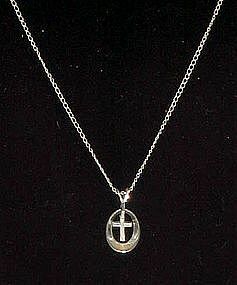 Very fine and dainty sterling silver cross and chain. Tag is marked Sterling on one side and Marvel on the other side Chain is 16" long including clasp.Cross is independant of the oval it hangs inside of. Pendant is 1/2" long. Nice.